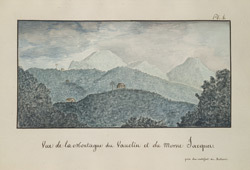 Vue de la Montagne du Vauclin et du Morne Jacque. bl.uk > Online Gallery Home	> Online exhibitions	> Caribbean Views: the full collection	> Vue de la Montagne du Vauclin et du Morne Jacque. Martinique's landscape is very rugged; the north of the island is dominated by the Pelée Mountain and the Carbet range, and the rest of the island is covered in large hills known as mornes. The highest of these is the Vauclin which reaches 1657 feet. The sketch was drawn by Alexandre Moreau de Jonnès.